Andalucia is a vast area with fabulous beaches, stunning mountain ranges and a huge range of gorgeous boutique hotels. Our journeys of exploration to visit boutique hotels in Andalucia radiate from our adopted home, of 20+ years in Jaen province, which borders with the provinces of Cordoba and Granada. From the Mediterranean coast of Almeria in the west to the Atlantic Ocean and the provinces of Cadiz and Huelva in the east Andalucia will amaze and delight you with its unique diversity, history and gastronomy, mountains and natural parks, ski resorts and beaches as well as its unique culture. It also has a wealth of UNESCO sites which help tell and bring alive the tumultuous history and the people who have inhabited this land. Explore this unique area staying in lovely Boutique Hotels in Andalucia. The autonomous region of Andalucia is divided into eight provinces, five of which are on the coast Almeria, Cadiz, Granada, Huelva and Malaga and the three land-locked ones of Cordoba, Jaen and Sevilla. Wherever you choose to visit you will be delighted by the monuments, history, gastronomy, boutique hotels and B&Bs and the people you encounter. Click on your chosen province to see our growing collection of special Spanish Boutique Hotels within its borders, Spanish hotels and B&Bs we’ve personally chosen and visited to share with you. Have you visited a great boutique hotel in Andalucia or the rest of Spain that you’d like to recommend to us? Would you like us to check one out for you? Do you want some help planning your trip to Spain? We offer a trip planning and/or hotel booking service with as much or little help as you want. Visit our Trip Planning page. We want you to enjoy Spain as much as we love living here. Search for hotels around Andalucia on Booking dot com. 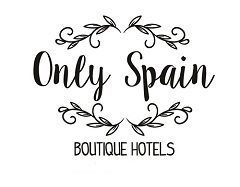 Head to Only Spain Boutique Hotel and B&Bs Home Page.